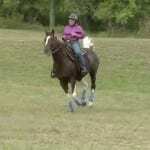 This is a directory list of all videos available on Horse Master TV Online with Julie Goodnight. Use the search engine in the menu bar to search on any key word to find other related content on this site. You can click on the show name to watch that video! Episode 1003: “Prince Charming” Behind the Scenes Get the right gear to work with your pony at JulieGoodnight.com/ponies. Protected: Episode 1010: “Eye Kandee” Behind-the-Scenes There is no excerpt because this is a protected post. 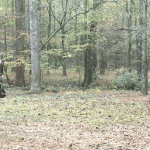 Episode 1018: “Serenity Now!” Behind the Scenes Julie Goodnight stops a horse from threatening to kick the handler. Episode 617 – Behind The Scenes Julie Goodnight works with Marte and talks more about position, how to be comfortable on long trail rides, what to wear, stirrup length, the benefit of standing up to ride as an exercise to feel your balance, and more. Episode 701 – Driving Miss Goodnight – Behind The Scenes Behind the Scenes of Driving Miss Goodnight: Julie Goodnight teaches a horse owner how to drive and back a truck and trailer. Episode 709 – My Mother’s Legacy – Behind The Scenes Julie Goodnight helps a daughter bond with her new, inherited horse. 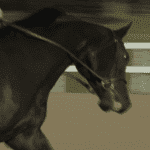 Episode 710 – Not So Fast – Behind The Scenes Julie Goodnight helps a horse and rider learn a cue to slow down. Episode 711 – Turning The Paige – Behind The Scenes Julie Goodnight helps a rider build confidence and gain her Off-The-Track-Thoroughbred’s respect. Episode 712 – Can I Get A ‘Yes Ma’am’? – Behind The Scenes Julie Goodnight teaches groundwork techniques to instill obedience and leadership. 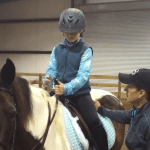 Episode 713 – Little Things That Count – Behind The Scenes Julie Goodnight teaches a young rider what it will take to show her Paint Horse at higher levels. 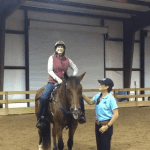 Episode 714 – Ask For More – Behind The Scenes A CHA instructor learns how to take her home-raised horse to the next training level with Julie’s help. 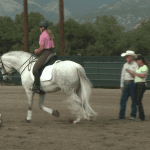 Episode 715 – Sideways – Behind The Scenes Julie Goodnight teaches a horse and rider to perfect the side pass. 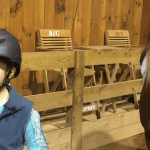 Episode 716 – Balance In Motion – Behind The Scenes Julie Goodnight helps a rider improve her balance and confidence so she can win in the AQHA show ring. 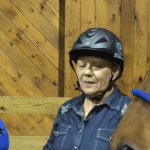 Episode 719 – Norwegian Feud – Behind The Scenes – Lasse Update Julie Goodnight helps an experienced horsewoman gain her horses respect, update on Lasse. Episode 801 – High Jumper – Behind The Scenes Julie Goodnight and Dale Myler help a strong, young jumping prospect gain control. 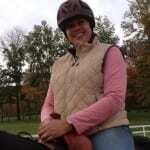 Episode 802 – The Trail Ahead – Behind The Scenes Julie Goodnight rided the trails with a gaited horse and discusses trail etiquette and safety. Episode 803 – Large And In Charge – Behind The Scenes Julie Goodnight teaches a handler to expect obedience and respect. Episode 804 – I Can See Clearly Now – Behind The Scenes Julie Goodnight teaches a young jumper to position herself to see the course. Episode 805 – Pleasure Perfect – Behind The Scenes Julie Goodnight and Dale Myler talk about collection and bits for advanced Western Shows. Episode 806 – Gateway To Success – Behind The Scenes Julie Goodnight teaches how to work a trail class obstacle gate. Episode 807 – Law And Order – Behind The Scenes Julie Goodnight Explains How Respect On The Ground Translates To Obedience In The Saddle. Episode 808 – Show Up – Behind The Scenes Julie Goodnight Teaches A Young Lady How To Prepare For Showmanship. Episode 809 – Step Up To Success – Behind The Scenes Julie Goodnight teaches a rider to cross trail obstacles. 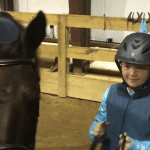 Episode 810 – Not Gonna Take It – Behind The Scenes Julie Goodnight helps a youth rider gain confidence and stop her horse from testing. 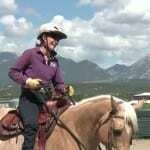 Episode 811 – Downhill Racer – Behind The Scenes Julie Goodnight teaches a horse to go downhill slowly, without bolting. 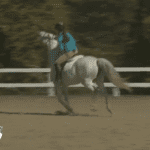 Episode 812 – Changing Planes – Behind The Scenes Julie Goodnight helps a rider understand how riding “behind the vertical” impacts her horse’s movement. 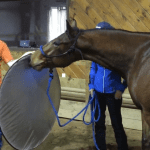 Episode 813 – Clean Up Your Act – Behind The Scenes Julie Goodnight helps a horse stop kicking out in the wash rack. 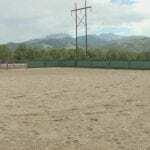 Episode 814 – Higher Education – Behind The Scenes Julie Goodnight judges a college equestrian team: overview of ranch riding classes. 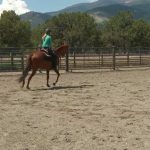 Episode 815 – Cross Over – Behind The Scenes Julie Goodnight helps a rider advance with the mare she raised; teaches leg yielding. 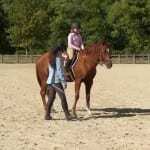 Episode 816 – Guiding Right – Behind The Scenes Julie Goodnight helps a rider learn to turn with little rein. Episode 817 – The Journey Continues – Behind The Scenes Julie Goodnight helps a rider gain confidence and pick up the right lead. Bonus footage not seen on TV. 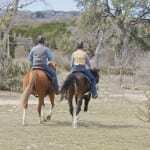 Episode 818 – Happy Trails – Behind The Scenes Julie Goodnight assists a married couple as they ride together on the trails. Bonus footage not seen on TV. Episode 819 – Collection Agency – Behind The Scenes Julie Goodnight helps an English rider work toward collection for showing. Bonus footage not seen on TV. Episode 820 – Pedals Are For Bikes – Behind The Scene Julie Goodnight helps a trail rider select the speed she wants without constant leg cues. Bonus footage not seen on TV. 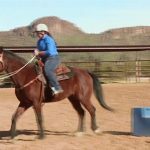 Episode 821 – Texas Two Step – Behind The Scenes Julie Goodnight helps a champion show horse learn to stand still at the mounting block. Bonus footage not seen on TV. 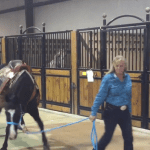 Episode 822 – Ranch Hands – Behind The Scenes Julie Goodnight helps a ranch rider refine her rein cues for horsemanship patterns and reining. Bonus footage not seen on TV. 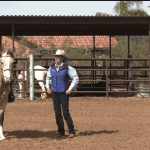 Episode 823 – When Wrong Is Right – Behind The Scenes Julie Goodnight teaches a versatility ranch horse prospect to counter canter for ultimate lead control. 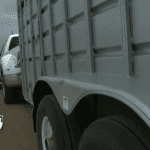 Bonus footage not seen on TV. Episode 824 – Bridging The Gap – Behind The Scenes Julie Goodnight assists a horse with white hairs on his back to find the best saddle fit. Bonus footage not seen on TV. 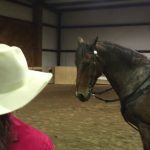 Episode 901 – Captain Morgan – Behind The Scenes Julie Goodnight helps a trail horse learn to step over instead of jump the ditch, then approach any water obstacle. Episode 902 – Queen Of The Drag – Behind The Scenes Julie Goodnight teaches a rider to pull a log behind her well-trained horse. Episode 903 – Wild About Bits – Behind The Scenes Julie Goodnight and Dale Myler introduce a mustang to the bit for the first time. 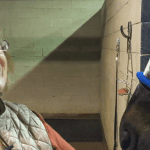 Episode 904 – The Doctor Will See You – Behind The Scenes Julie Goodnight and Veterinarian Deb Schultz work with a horse whose pain was keeping him from performing. 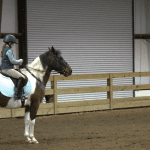 Episode 905 – Lil Bit Of Groundwork – Behind The Scenes Julie Goodnight helps a newly adopted horse and her owner learn to communicate clearly before riding. 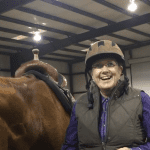 Episode 906 – Race To Rescue – Behind The Scenes Julie Goodnight and Dale Myler help a rescued, off-the-track Thoroughbred learn new rein and bit cues so he can be adopted as a pleasure mount. Episode 907 – Don’t Blame Me – Behind The Scenes Julie Goodnight helps a rider get to the root of her horse’s dangerous rearing behaviors. Episode 908 – Cross Dressed – Behind The Scenes Julie Goodnight helps an English rider find and fit a Western saddle so she can take comfortable trail rides. Episode 909 – Cast Interviews and Show Planning – Behind The Scenes A behind the scenes look at planning how to help Shadow. Episode 909 – Shadow’s Investigative Behavior – Behind The Scenes Shadow practices his new investigative behavior following a cameraman. 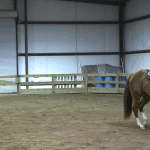 Episode 910 – Braking Gait – Behind The Scenes Learning to canter on a young horse who hasn’t held the gait before and who has learned to stop. Episode 910 – Diego Investigates Production Equipment – Behind The Scenes Diego shows investigative behavior on a reflector during the shoot. Episode 910 – Learning About Diego – Behind The Scenes Julie talks with Sandra about where Diego came from and what he’s done until now. Episode 911 – After The Interview With Kim – Behind The Scenes Kim chats about how she got Minnie Passer, and the hardship of losing her heart horse. 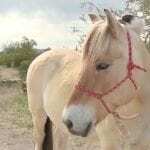 Episode 911 – Not For Sale – Behind The Scenes This Western Pleasure turned Western Dressage horse didn’t click with her owner before working with Goodnight; now she’s not for sale. 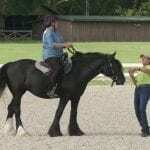 Episode 912 – How To Pulley Rein – Behind The Scenes Julie demonstrates how to pulley rein on Roscoe. 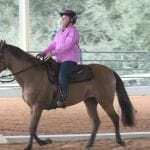 Episode 912 – How To Use Rein To Control Speed – Behind The Scenes Julie talks with Joanne about how she should use rein to control Roscoe’s speed. Episode 912 – Joanne’s First Time on the Show – Behind The Scenes Joanne talks about how her last time on the show brought enjoyment back to her rides, and what she’s here to work on now. 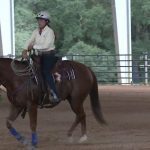 Episode 912 – Speed Limit – Behind The Scenes Julie Goodnight helps a trail horse canter with control. Episode 913 – He Would Run Through Fire For Me – Behind The Seens Katie talks about her bond with Stormy. Episode 913 – How To Shorten English Reins – Behind The Scenes Julie shows Katie how to shorten her English reins. Episode 913 – Taken by Stormy – Behind The Scenes Meet a Chincoteague pony named Stormy and his young rider who is learning to trot patterns and take control. Episode 914 – Ranger Learning New Expectations – Behind The Scenes Tommie talks about how it feels now that Ranger knows what her expectations are. Episode 915 – Cowgirl’s First Day – Behind The Scenes Julie, Cowgirl’s owner, talks about her first day of learning a simple lead change. 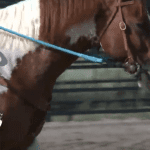 Episode 916 – Changing Bits To Refine A Well Trained Horse – Behind The Scenes Julie talks with Cindy about how changing the bit on her well trained Ranch Riding show horse makes a difference in self-carriage. Interview With Rebecca Vado Julie Goodnight has a quick interview with Rebecca. Interviews With The Camera Crew – Behind The Scenes Heidi interviews the crew at White Stallion Ranch with her phone camera. Introducing the Myler 3-Ring Combination/36 Mouthpiece Bit for the First Time In this video clip from Horse Master Episode 906, Julie Goodnight and Dale Myler introduce the Myler 3-Ring Combination/36 Mouthpiece Bit to a horse for the first time. 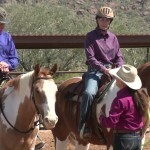 They discuss the mechanics of the bit and demonstrate how to get the horse familiar with the new bit from the ground before getting in the saddle.